For this particular modification implementation we have custom routed two small 1/8" x 5/16" slots in the pickguard, custom designed a unique stainless steel mounting bracket to secure both of the mini-toggle switches in alignment with the two slots in the pickguard which is then fastened securely in place with the volume and tone potentiometers. This custom mini-toggle switch mounting bracket provides a recessed or lowered profile of both switches that only allows a small portion (approx. 1/4") of each switch lever to protrude through the top side of the pickguard. This particular kits recessed mini-toggle switch modification kit is the only one of our kits we offer that WILL WORK with a Super 5-Way pickup selector switch and that is it's primary intention in it's design. It's recessed mini-toggle switch mounting bracket was specifically designed to be able to accommodate the Super 5-Way pickup selector switch and two DPDT mini-toggle switches for wiring modification switching. The Super 5-Way switch is much wider than a standard 5-way switch so certain considerations had to be taken into account in the design. Completed guitar is shown for reference and illustration purposes only, it is not for sale. Only those components listed below are included in this kit. This particular modification works quite well with the Super 5-Way Pickup Selector Switch and a couple of 4 conductor Humbucking pickups. The guitar pictured above has two SPDT (on/on) mini-toggle switches with two Seymour Duncan full sized Humbucking pickups; a JB Model TB-4 in the bridge position and a Jazz Model SH-2 in the neck position. 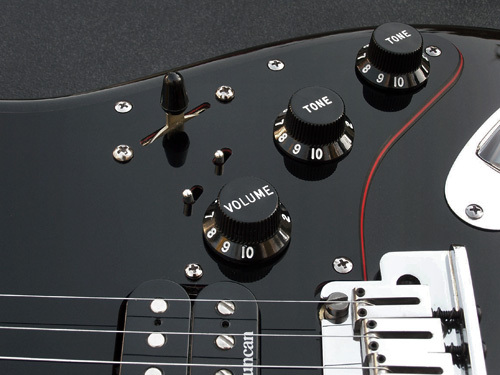 This combination of pickups and switches offers 17 different and unique pickup selection options. Includes Series, Parallel, Phasing and Coil Splitting. IMPORTANT NOTE: If you are selecting your modification kit with one of the '62 vintage pickguards or '57 vintage pickguard they are unshielded as provided by Fender. To have the genuine Fender® aluminum '62 pickguard shield or '57 control area shield included please add it separately below using the appropriate "Add to Cart" button. The '62 vintage aluminum pickguard shield is a full pickguard coverage shield. The '57 vintage aluminum pickguard shield is a control area only shield. These shielding's are specific and authentic to how they were originally built by Fender® during the respective era with the obvious exception of the custom modification which allows the recessed mini-toggle switches to protrude through. Custom Stainless Steel Recessed Mini-Toggle Switch Mounting Bracket (Two switch type for Super 5-Way). Tone Capacitor - Polyester Film Orange Drop (Your choice of one of the following). Fender® Super 5-Way Pickup Selector Switch.